"We strike hard and fade away into the night . . ."
Welcome to the rooftops and sewers of New York City, where ninjas, mutants, and aliens prowl, and a special group of heroes . . . kicks down the door, kills the monsters, and steals their loot! 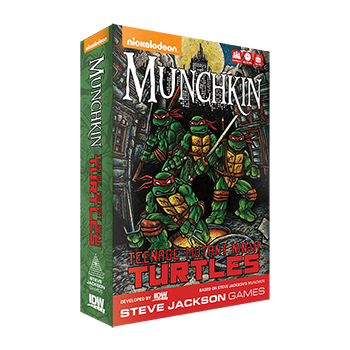 We are excited to announce that IDW Games, in conjunction with Steve Jackson Games and Nickelodeon, is producing Munchkin: Teenage Mutant Ninja Turtles in both a standard edition and two special editions, Deluxe and Deluxe Ultimate. 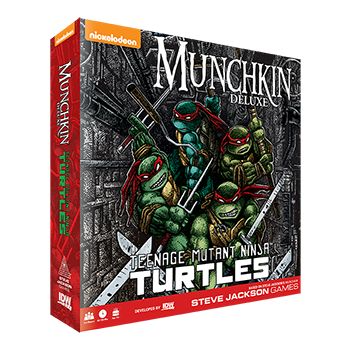 TMNT founding artist Kevin Eastman is also involved with the project. IDW will be supporting the game with a Kickstarter campaign, beginning 11 am PST on March 7. For more details, see the official IDW announcement. 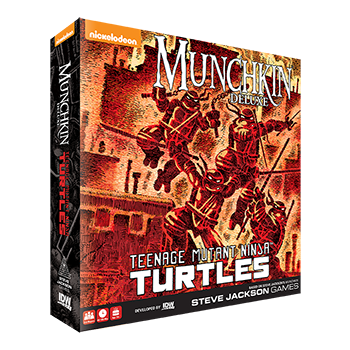 Speaking as a fan of the Turtles since the '80s, I am thrilled that we are mixing Munchkin and mutants! I can't wait to Team-up with Casey Jones to fight Shredder. Grab your Sai, Katana, Nunchuck, or Staff and get ready to rumble!